Worf is facing a hearing to determine if he will be extradited to the Klingon Empire for trial. While protecting a civilian convoy from Klingon attack, he opened fire on a ship that turned out to be a Klingon civilian ship, killing everyone aboard. Not only is his freedom at stake, but finding a Starfleet officer culpable in a massacre could weaken the Federation's position in the entire area. However, as is so often the case with Klingons and their politics, not everything is as it seems. And one! And two! And stretch! and ROOOOAAARRR!!!! Kevin: This is a good idea for an episode. The mushy ethical and legal quagmire of war is an interesting one. I don't even mind the slight lack of procedural clarity, since as this was an extradition hearing, not a trial, the real life counterpart would have more flexibility and fewer rules, since technically the only question is whether or not there is enough to proceed to a trial, not really answer the question of Worf's actual guilt. I did think the speech at the beginning about determining what Worf's "heart" was feeling was a bit weird. That can't be the basis for jurisdiction. The incident happened in interstellar space, and given how much they kept harping about blind Klingon bloodlust, I have a hard time believing Klingon law would even hold him culpable. I like that they tied it in to Worf's alienation to both station life and his Klingoness. It was more effective than sparring with Odo over security protocol. That all being said, Worf was weirdly absent from the episode. There are large swaths where he just sits there, staring. I think the writers got too caught up in their hook of the flashbacks, but I'll get to that below. Matthew: I agree on the weirdness. I found it odd that two governments with no formal relations would have an extradition agreement. Seems like Starfleet should have just given the Klingons a big "F-you" and warned them not to decloak in front of Starfleet vessels engaged in combat. So there was a lack of connection with the driver of the plot, the notion of culpability and guilt, from either side.That said, you can't really fault trial episodes for not packing drama. It's a well-worn TV trope for a reason. On a basic level, this plot just works, even when the brain can find all sorts of reasons for nitpicking. Kevin: Normally, I like a good Klingon politics episode, and it did lead to some fun sparring between Ch'Pok and Sisko, but I did not like the eventual plot twist that it was a plant. It was kind of obvious from one of the early flashbacks on the bridge. The civilian ship just happens to decloak exactly where the Bird of Prey was supposed to be? That's a little too convenient. I do like that neither Sisko nor Worf let Worf off the hook. He should have made sure what he was firing at and the final scene in his quarters, particularly about a good commander's obligations to his crew's morale was nicely done. I still think the actual question of guilt could have been made more interesting. Maybe Worf could have been on the Defiant with Sisko in command and jumped the order to fire believing it to be the bird of prey or something. That could have kept the focus on Starfleet rules and made the exploration of Worf's state of mind a little more cogent. I also liked some of the exploration of the ethics of decisions in battle. Does it matter that Worf went in gunning for a fight? O'Brien may disagree with the decision, but takes pains to clarify that his hindsight should not be treated as more than that. I think with a little more work, that could have been a good focus for the episode, too. Matthew: The hoax seemed too simple. If it were possible to obtain the information necessary to uncover it within a day or two, wouldn't Starfleet have done the due diligence on its own, especially since it was so easy? It seems like the Klingons should have used decedents from all over instead of from one ship. Or heck, just made people up and loaded the ship with organic compounds. Did they keep the bodies from this other ship on ice for months, waiting for this opportunity? 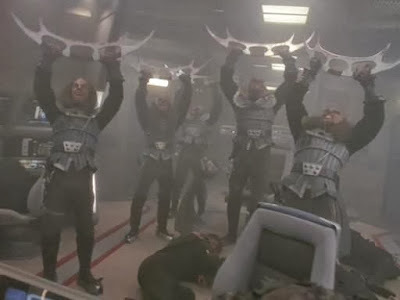 What irritated me about the way the hearing played out was how the judge says "this will stop" to the Klingon's goading tactics, and then lets it continue until the point it erupts into a physical altercation. It's a cheesy Law & Order writing tactic, goading the witness into some revealing confession. But what does it really prove, anyway? It's a pretty big leap from "Worf will assault a Klingon who is intentionally insulting him in a culturally relevant way" to "Worf will kill non-belligerents in a battle situation." Two questions I still have are 1. why doesn't O'Brien fire in the hypothetical? They raie the question and then fail to answer it.I suppose it is answered by Sisko at the end of the show, but I wanted to hear it from O'Brien, because it would say something about his character. Also, the Klingon advocate says that Worf was raised by humans "on Earth." Not Gault? Tsk tsk. Kevin: I did like a lot of the character work in the episode. The scenes of sparring with Dax were good, and it was interesting to see O'Brien conflicted between loyalty and honesty. I liked the scene with Sisko and Worf in his quarters at the end on an emotional and not just a plot level. I think our military rules would pretty clearly exonerate Worf, but Starfleet clearly wouldn't. I think it did a good job of reinforcing the way Starfleet views the universe. Worf's self-assessment about his motives is good for the conflict in the episode and it makes him more interesting as a character. Matthew: Yeah, however hokey the plot elements were, it was interesting to see Worf struggle with his emotions, and to see Sisko offering him advice on how to be a command-track officer despite them. Kevin: Everyone did at least a good job. I think Brooks was good in his sparing with Ch'Pok and he never crossed the line into scenery chewing. Speaking of the sparring, Ron Canada is back as another officious official, but he has more teeth this time. I enjoyed watching him build a case and goad Worf and all that. He really brought life to the role. Matthew: Brooks went a bit far in line readings for me, personally. Courtroom scenes can play to the worst tendencies of actors, and Brooks certainly has some of those. He could have pulled out a magnifying glass and a pipe and it wouldn't have seemed too out of place. Canada on the other hand was terrific. The way he licked his jagged teeth really communicated volumes about the character with a simple gesture (and not turning up the volume, literally, like Brooks). Kevin: Michael Dorn was good when they gave him lines. I liked his scene at the end with Sisko a lot. His self-reflection adds depth to the character. He has better and more interesting shows, but for what he does do here, I think he does well. Matthew: Dorn is the polar opposite of Brooks, and it's one of the things that makes them interesting to watch together. Dorn is all about letting just a little bit peek through a stoical exterior. Colm Meaney really communicated his conflict on the witness stand. You really got the feeling he was pained, but also that he was habitually honest. Kevin: Here's where the episode falls apart for me. From a technical standpoint, the live flashback hook is interesting, and well-executed. It reminds me of "A Matter of Perspective," and I kind of wondered why not just recreate the events on the holosuite, though I guess that would have read as flatly repetitive. LeVar Burton directed this one, and like I said, I think the camera and layout work was great. From a writing standpoint, it swallowed the story. The story spent so much time cleverly delivering the flashbacks that it forgot to give Worf time to be in the fore of the story. Behr says as much in an interview, and he's right. Matthew: Personally, I loved it. I thought it was just the thing to freshen up the feel of the series. I don't think it detracted from the story, instead it gave the actors a chance to show what their characters are feeling both while they testify and while they are in the moment described. Kevin: This is a 3. There is an interesting enough idea, and the camera tricks are novel and interesting enough, that coupled with solid acting keeps this from being a bad episode. The only sad thing is that I think with this many ideas and this interesting an execution, this was not too far away from being a great episode.